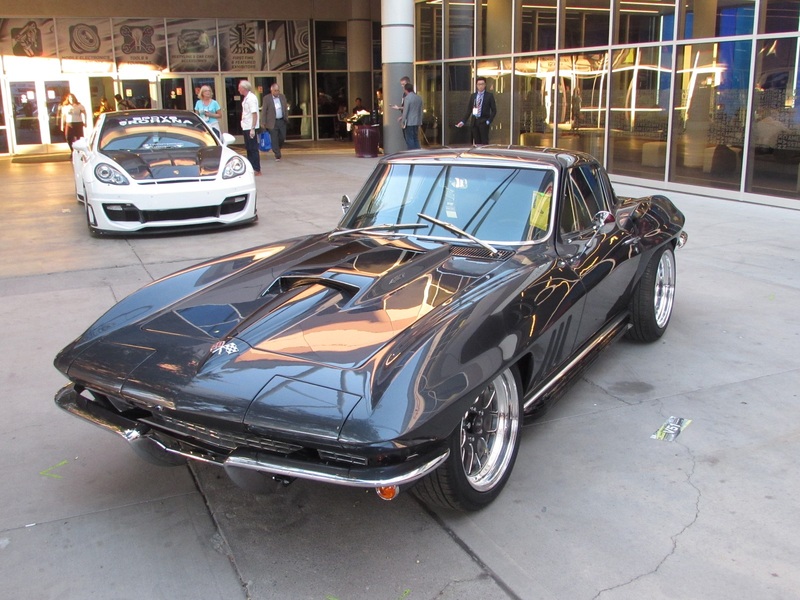 Placement is key at the SEMA Show, and the RDR vette was handpicked to sit directly in front of the main entrance. The Red Dirt Rodz crew recently unveiled their latest creation, a 1966 Corvette coupe at the 2014 SEMA Show in Las Vegas. After an intensive 8-month build, the project resulted in a top-ten finish, as the Corvette was named one of the Top Ten Hottest Hot Rods of SEMA by Yahoo! Autos. “Being included in this list is a huge honor”, said Jefferson Bryant, owner of Red Dirt Rodz, “It makes all of the late nights and hard work worth it.” Building a custom Corvette is a particularly touchy subject. These cars are highly revered and it is certainly easy to kill the original style of the car with funky body mods. To that end, the RDR crew went after this build in a strategic fashion, making sure that the original appeal and styling of the second-generation (also called C2 or Mid-Year) Corvette remained, while taking the performance to the next level. The Chevrolet Performance ZZ427 engine makes 430 tire-shredding horsepower. Luckily, the Vette has the suspension to tame it. The build began with a basket case 66 coupe and chassis. The car was running, but in bad shape. Multiple accidents and 1980s-era body mods had been made to the car, so going back to original just didn’t make a lot of sense. 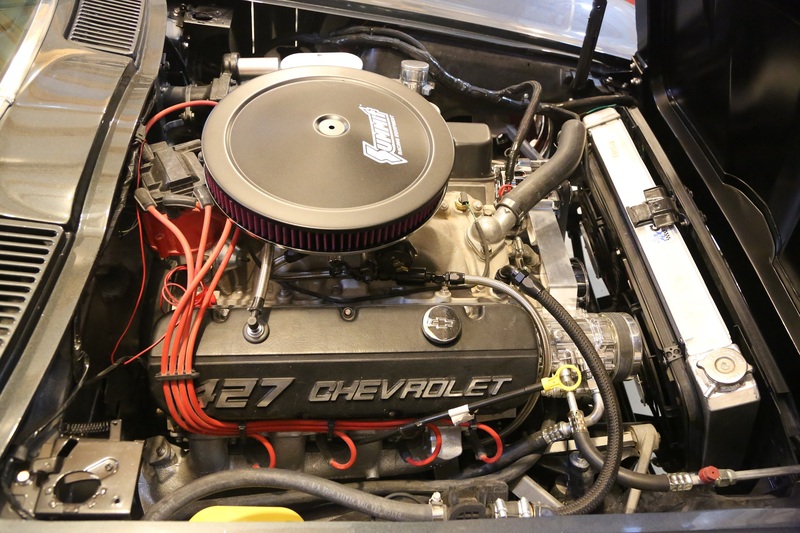 The original 327 needed rebuilt, so it was replaced with a new ZZ427 crate engine from Chevrolet Performance. “The 430-horsepower engine dropped right into the frame like it was designed to do” Bryant told us, “The transmission was a different story.” Putting the power to the ground is a Tremec T56 6-speed manual transmission connected to the original rear end with 3.73 gears. The center crossmember in the frame was removed and replaced with a new unit fabricated in the RDR studio. This new piece is removable for servicing and allowed the T56 to clear the floor pan of the body without hanging to low. The Sharkbite suspension system from Speed Direct is a direct replacement for the factory components, and it functions so much better. Upgrading the entire suspension is critical for proper handling. 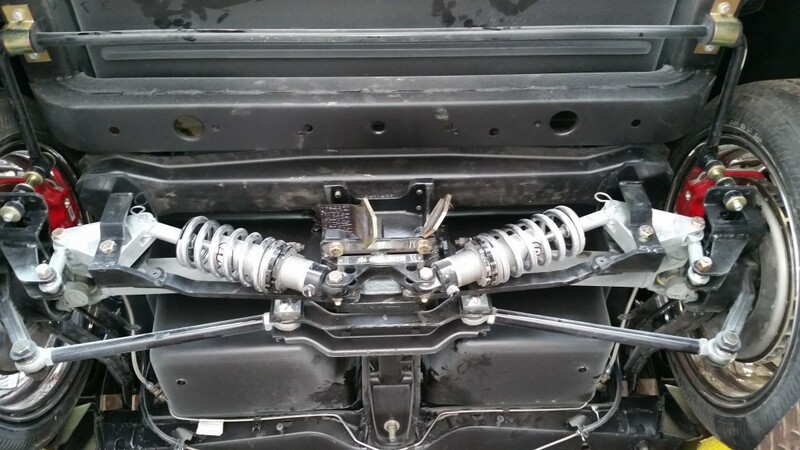 Both the front and rear components were replaced with the Sharkbite system from Speed Direct. This coil-over design allows the ride height to be tuned to the owner’s liking and handles significantly better than the factory design. “1850s buggy spring technology has no place in a modern hot rod” says Bryant, “The Sharkbite system guts the rear transverse leaf spring and replaces it with a set of rocker-arm actuated coil-over shocks for drastically improved ride and handling.” Each shock also allows the driver to tune the shocks for road conditions. Weld’s newest wheel, the S77B, is a stunner, and looks right at home on the C2. 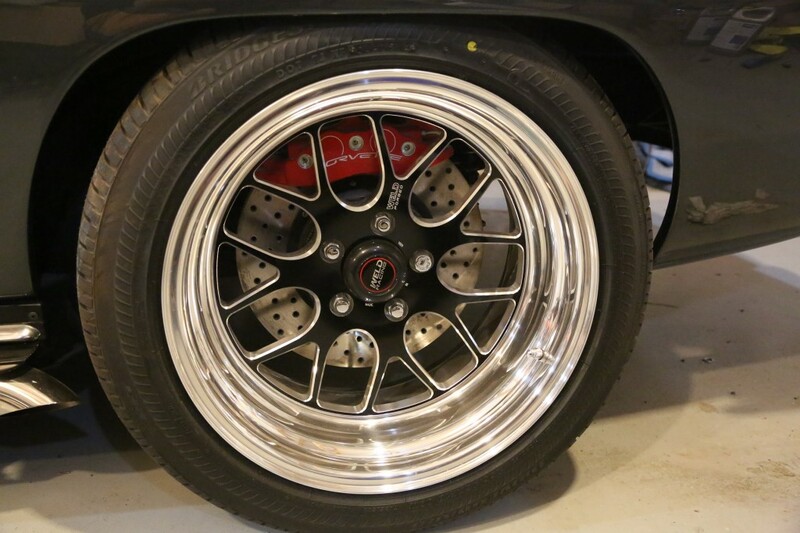 From the factory, the Corvette used 6.5-inch wide wheels, which by today’s standards are quite narrow. In order to fit wider wheels without modifying the chassis required widening the body itself. The rear fenders were stretched 2 inches per side, and the fronts were stretched 1 inch per side. The extra room meant that the Weld Racing wheels would actually fit the body. The Vette runs 18x8s in the front and 18×9.5s out back with a set of Bridgestone Driveguard run-flat tires for worry-free cruising. Vacuum brakes with a big cam are no good, so a hydroboost was installed. This provides over 1.5 tons of braking pressure. 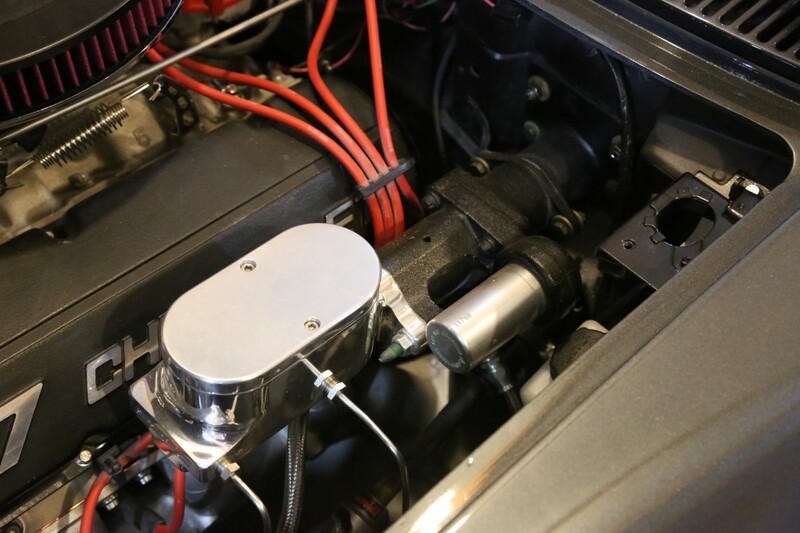 Instead of relying on vacuum-assisted brakes, which would not be very good considering the large cam in the big block, RDR swapped in a Hydroboost behind the billet master cylinder. A hydroboost uses hydraulic pressure from the power steering system to assist the brakes. This is a truly active braking system, the pedal pushes back on your foot when the engine roars to life. Though the factory 4-wheel disc brakes are capable of stopping the car, the brakes were upgraded to C6 Z06 Corvette brakes from Speed Direct. These brakes use the same calipers as the C6 Z06 with 13-inch drilled and slotted rotors and ceramic pads to ensure the car stops every time without any brake fade. Instead using some boring factory color, RDR chose to use the new metallic gray from the 2014 C7 Corvette. It is called Cyber Gray, and it is perfect for the C2 body lines. The body was painted with Axalta paint in the new C7 Corvette color “Cyber Gray”. It seems as if this color was formulated just for the C2, as each blue metal flake pops and rolls off of each bodyline. A ’67 stinger hood was installed on the car, and a jet black stinger striped painted on it to break up the gray. 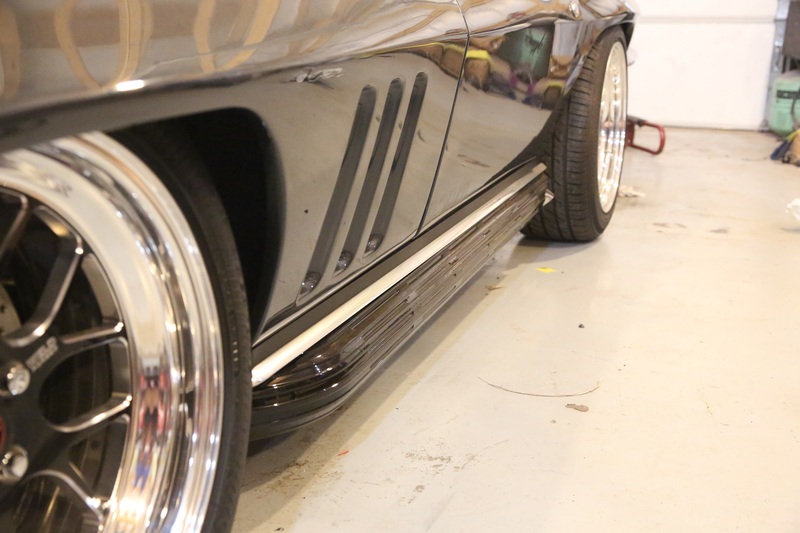 RDR installed a set of sidepipes on the coupe, and used fiberglass reproduction covers painted in gloss black to give the car a more aggressive, sinister look. “I like the C2 with polished side pipe covers, but this car needed attitude, and I think the painted covers bring that in spades” Jefferson told us. The painted exhaust side covers give the car a lowered look and play up the aggressive tone of the build. This coupe is absolutely a street-driven car. The interior has been left mostly stock, with a few tweaks. 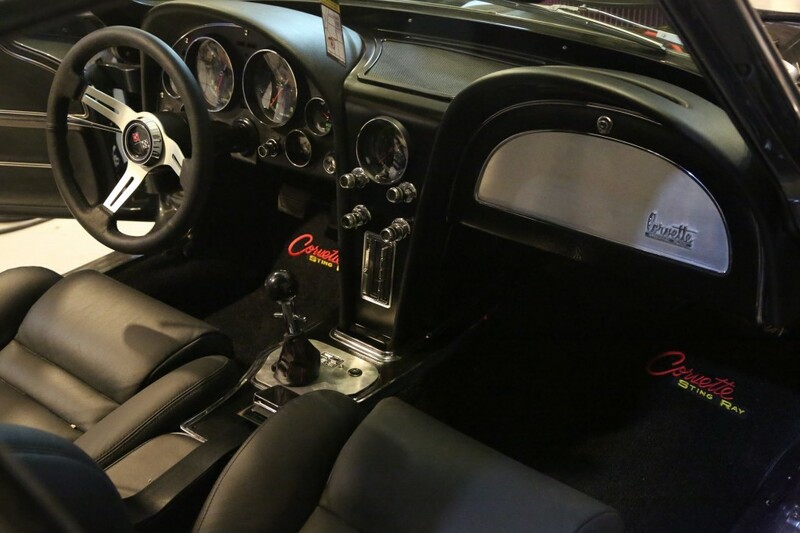 The gauges were rebuilt and converted to electric movements, with a 160-MPH speedo and a 6500 RPM redline on the tach. The seats are Procar Elites with black leather and custom seat heaters. A Vintage Air AC system was installed to keep the car cool in the hot New Mexico sun, where it will be driven daily. Inside the cockpit, the rebuild original gauges and restored dash take you back to 1966, but all of the function is modern. Except for the radio, that is 100% original, and it sounds just right. 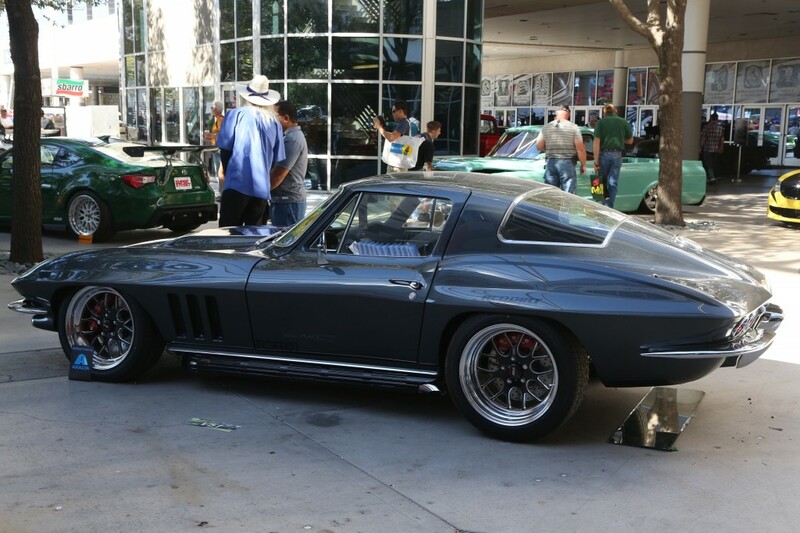 The C2 body is considered by many to be the most beautiful and often the most desired of all generations of Corvette, and judging by the crowds that gather wherever it goes; this coupe is proving that to be true. Just installed a ZZ427 in my 1966 Corvette. What oil pan did you use? We used the factory sheet metal pan. Worked out great.